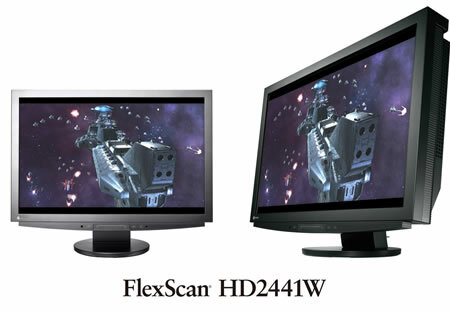 Eizo Nanao Corporation today announced the release of a full high-definition monitor, the FlexScan HD2441W.Featuring two High-Definition Multimedia Interface (HDMI) inputs; the FlexScan HD2441W is ready for connecting with other full HD devices that also come with HDMI ports. 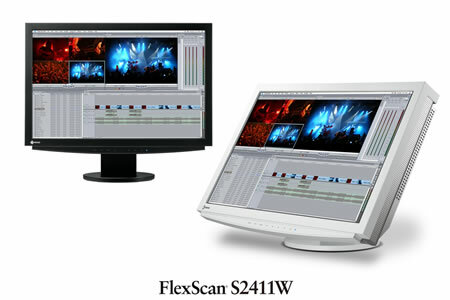 The FlexScan HD2441W has a 1920 × 1200 native resolution and can display full HD images at 1920 × 1080p. It can detect the amount of change in an image and applies the ideal degree of interlace/progressive conversion to minimize artifacts. In addition to the standard 480i to 480p (interlace to progressive) conversion, it produces high quality images even when doing high speed processing necessary for 1080i to 1080p conversion. Designed for optimum connectivity, the HD2441W comes with a comprehensive range of input connectors. In addition to the dual HDMI inputs, DVI-D (digital) and D-sub (analog) inputs for connection to two PCs are also included as is a USB hub with two upstream and two downstream ports. By connecting the PCs to the monitor through the upstream ports, two USB-compatible peripherals such as a mouse and keyboard can then be shared among both PCs, reducing desktop clutter. Furthermore, with the HD2441W’s audio output jack, one set of speakers can be used for both PCs as well as any audio/video devices connected through the HDMI inputs.To ensure the screen is never too bright or too dark, EIZO’s Bright Regulator function reads the ambient light of the office environment and adjusts the screen brightness accordingly. In addition, the sensor counteracts the effects of a power surge to keep brightness stable. The FlexScan HD2441W is now shipping. Date of availability varies by country.